This is a beginner to intermediate level crochet pattern that you can make every year and share with a friend. Free crochet patterns like this one are so cute. The Easter basket can hold all your goodies. Ch 20, attach to the 19th st on the other side (should be half way around) by sl st, work 1 sc in each ch back across, fasten off. Note: You might want to feed some wiring through the handle to stiffen it. Read about Phyllis and her many creative talents! I went to Hobby Lobby in the craft section. Bought Bonnie Craft Cord. I also switched hook to K or N.
where do u find the twine? did anyone find the twine? 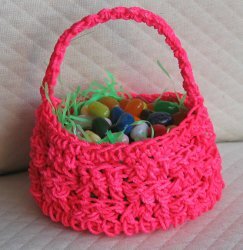 Where do you get the nylon twine for this Easter basket?? I have looked on the internet and cannot find it. Why put in a pattern with material that is not easily found?? I would love to make this basket, but where do you fine the nylon twine that was used, please? did u find the twine?